Eurocom Corporation, a leader in the Desktop Replacement notebook technology since 1989, has launched today the world's first notebook based on NVIDIA SLI high-definition graphics for unparalled gaming experience. The NVIDIA SLI technology provides up to 2x the performance of a single notebook GPU resulting in a stunning increase in graphics performance. Two graphics cards could be combined in something called an SLI, Scan Line Interleave, configuration. The NVIDIA GeForce Go 7800 GTX graphics processing units (GPUs) deliver powerful, elegant and super-rich graphics for games and other graphics-intensive applications. Combining two NVIDIA SLI-certified GeForce Go 7800 GTX -based graphics cards in a single system allows to essentially double graphics performance. NVIDIA SLI-certified GPUs feature dedicated, built-in SLI hardware and take advantage of the additional bandwidth of the PCI Express bus architecture. Connected by the SLI connector, each NVIDIA GPU has a maximized connection pathway, and can leverage the second card for reaching top-speed performances. Unlike previous dual-card solutions, NVIDIA SLI can output in both digital and analog formats for the highest image quality. 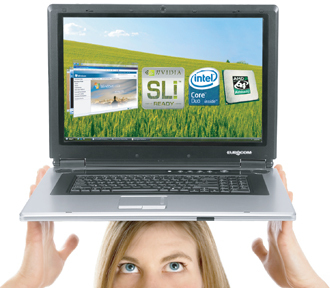 The first notebook to feature two NVIDIA GeForce Go7800GTX notebook graphics processing unit (GPUs) equipped with 256MB of superfast GDDR3, is EUROCOM M590K Emperor sporting 19-inch Widescreen WSXGA+ 1680-by-1050 pixels resolution display with a 16:9 aspect ratio and the fastest 64-bit Mobile Turion64 processor. This high-end gaming and professional fully upgradeable Supernotebook is coming to the market wonderfully suited for users doing 3D animation, 3D simulation, publishing and graphics work. The 290-nits brightness ensures that even in direct sunlight you can see the display clearly.